Here are the foods highest in magnesium so you can be sure you’ve always got this important mineral topped up. They run the gamut from seeds and beans to fruits and vegetables, and each brings with it added vitamins and minerals so you’re getting plenty in the way of nutrition. Magnesium is important as it can help you avoid cardiovascular disease, can be helpful for those with diabetes and can help the brain in its daily functions. Signs that you’re running low on magnesium include leg cramps, which may be a subtle sign you might overlook, or a general feeling of fatigue or weakness. Check with your doctor if you’re concerned that your magnesium level is not where is should be. 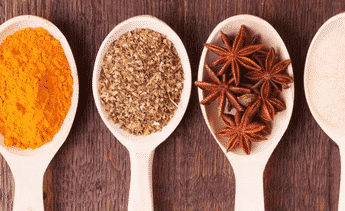 While it may be tempting to rely on some of these foods for your magnesium needs, since they’re so rich in it, you’ll want to share the responsibility over a large assortment of foods and reach your total from multiple sources. Flaxseed usually gets credit for its high levels of omega-3s, but it is also a fantastic source of magnesium. The good news is that you don’t have to eat 100 grams of flaxseed in order to reap the benefits. Smaller servings will still give you plenty of magnesium and you can make up the difference with other foods throughout the day. Ground flaxseed is easiest to work with and ensures that you’ll actually use it. You can also opt for flaxseed oil. But let’s not overlook the impressive amounts of omega-3s that flaxseed contains. This will help the body fight off free radical damage. 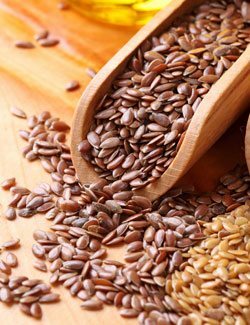 Most of the time it’s oily fish that contains omega-3s, but flaxseed is a nice plant-based source of them. Tips for eating more: Ground flaxseed is one of the easiest foods to eat more of because it disappears into soups and stews and goes relatively unnoticed on top of a salad. Dark chocolate is a magnesium powerhouse, providing almost a full day’s supply in a 100 gram serving. You probably won’t want to eat 100 grams of dark chocolate in one sitting, which is good because there are plenty of other foods that can help you hit your magnesium mark. 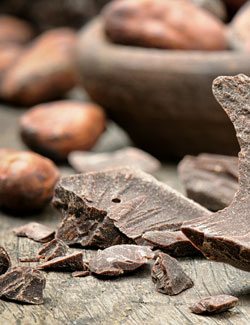 You can get an energy boost by having just a small amount of dark chocolate thanks in part to the magnesium it contains. You’ll also feel better, since chocolate has long been known to help the body produce endorphins. Dark chocolate also contains antioxidants not found in milk chocolate. These will help you fend off free radicals in the body. Try out the different percentages of dark chocolate to see which one you prefer. The higher the percentage, the more bitter the chocolate will be, but the more pure it will be as well. Tips for eating more: It’s not hard to eat more chocolate, but make sure you’re using dark chocolate and not milk chocolate to avoid the extra sugar used in milk chocolate. Nibble on a bit of dark chocolate when you get a craving, or as a dessert after a meal. Sunflower seeds provide quite a punch when it comes to magnesium, and they also provide other nutrients and minerals making them an excellent snack time choice. The magnesium found in sunflower seeds will help you keep calm when things get stressful. They also contain protein and fiber, which helps you feel full for a longer period of time, and they are a good source of selenium, which has been shown to have anti-cancer properties. 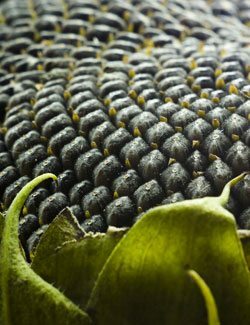 If you’re worried about eating sunflower seeds because of their fat content, it’s time to reevaluate them. The fat they contain is mostly healthy fat in the form of polyunsaturated and monounsaturated fat. You’ll still want to watch your intake of them, as to keep your total fat at healthy levels for the day. Tips for eating more: Keep a supply of sunflower seeds handy, and make like the baseball players. Choose unsalted sunflower seeds to keep your sodium levels in check. Cashews have an impressive amount of magnesium, and even a one ounce serving will provide you with one fifth of what you need for the day. This will help strengthen bones and balance blood sugar levels, among the other benefits magnesium provides. In addition to magnesium cashews also provide you with iron and potassium, as well as protein. This makes it a very well rounded snack that can help you build muscle, avoid an anemic state, and assist with healthy blood pressure levels. Cashews are a good source of healthy fats, which will actually help you lose fat rather than gain it when eaten as part of a proper diet. 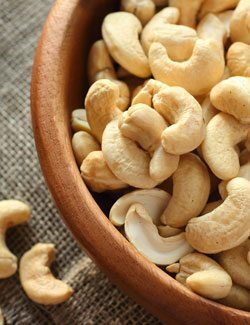 Tips for eating more: Cashews make a great snack all by themselves, but can also be added to a stir fry or a vegetable like green beans to boost the magnesium content of the meal. Soybeans have a great deal of magnesium in them, and they’re also known for their protein, healthy fats, and iron levels. The fiber in soybeans is also very high, so you’re getting a lot of benefit from one food. The magnesium will help you sleep better, and along with the fiber will help prevent constipation. The protein will balance out your meal, and when combined with the healthy fat it contains will keep you satiated for several hours. 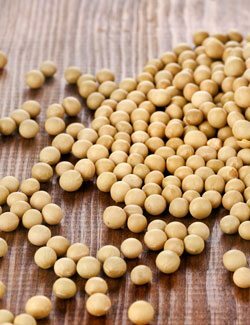 Because of the high protein content in soybeans, you’ll often see soy-derived products stand in as meat replacements. Tofu and tempeh are popular vegan and vegetarian options for subbing out meat, providing protein and other essential minerals, much like meat does. Tips for eating more: Soybeans may not be the most delicious thing to eat all by themselves, but they can be used in your cooking by adding them to soup or chili, or in a processed form like tofu or tempeh, although you’ll be losing much of the magnesium if you go this route. Pumpkin seeds are one of the healthier snack options out there, and their magnesium content is only part of the equation. The magnesium and tryptophan in pumpkin seeds will help the body relax and drift off to sleep at night. The protein they contain will work to keep your blood glucose in check. They’re also a good source of zinc, which benefits the prostate, as well as omega-3s which provide protection from inflammation, heart disease, and free radical damage. Go with organic raw pumpkin seeds rather than the conventional roasted kind you’ll find most often in stores. It’s worth the extra searching to know that you’re getting a top quality product, and if you’re eating pumpkin seeds for health, you’ll want to make sure you avoid the unhealthy additives found in conventional seeds. 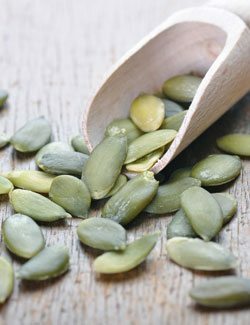 Tips for eating more: Pumpkin seeds taste great sprinkled on a salad, and they can also be eaten by themselves as a snack, much like sunflower seeds. 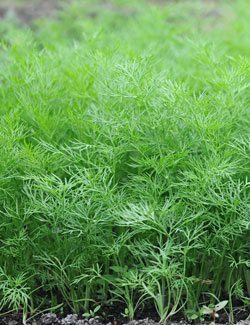 Dill weed should be part of your spice collection, as it provides a nice flavor as well as plenty of magnesium. Since it contains a high concentration of magnesium, you don’t have to use a lot in order to get a good supply. Dill provides antioxidant benefits to the body, and also provides important vitamins like Vitamin A and Vitamin C, which will improve the condition of your skin and strengthen your immune system, respectively. The flavonoids in dill have been shown to have anti-cancer benefits, which is one more reason why you’ll want to start adding this to more of your meals. Tips for eating more: Dill weed can be used as a seasoning herb on chicken and fish, and tastes best when combined with lemon juice. Try sprinkling it on your next chicken breast or fish fillet with a squeeze of lemon. Quinoa is chock-full of magnesium, which is not surprising as it is a good source of plenty of other minerals, vitamins, and healthy substances like fiber. 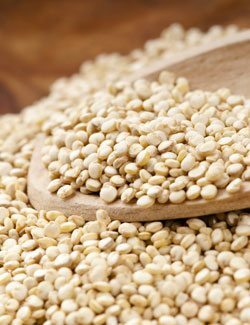 A 100 gram serving of quinoa will give you roughly half of your day’s supply of magnesium. This means you could eat half of that and get a quarter of what you need from other sources. It’s always good to rely on a variety of foods to meet your nutritional needs, rather than depending on one magnesium-rich food to carry the entire load. Quinoa has made the rounds in health food circles for years, and has gained mainstream awareness recently due to its nutritional profile. The big draw to quinoa is that it’s a gluten-free way to get more protein and fiber, as well as important minerals like magnesium. Tips for eating more: Quinoa is an excellent replacement for rice or couscous because of its extra minerals, fiber and protein. Use it in place of rice as a side dish or even for things like sushi. 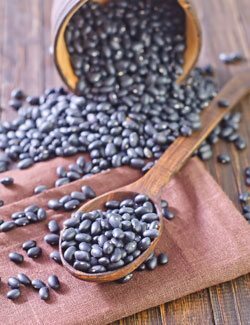 Beans in general are a good source of magnesium, not just black turtle beans. They are also full of calcium, iron, and fiber, making them a well rounded food. Beans provide plenty of soluble fiber which will help your digestive system and can help you prevent the formation of polyps on the colon which could lead to colon cancer. They’re also good for your heart, and can help you with your blood sugar levels if you’re diabetic, or just trying to prevent diabetes. Unless you don’t process them well, beans are a great addition to most diet plans because they are digested slowly, causing you to feel satisfied long after you’ve eaten. They’re also a great source of fiber and protein, a combination that works well for weight loss and overall health. Tips for eating more: Beans make the perfect side dish, but they can also be easily incorporated into a main dish, casserole, stew, or salad. A three bean salad is a great way to boost your magnesium, as well as your fiber and protein. Peanut butter has a good amount of magnesium in it. Two tablespoons will give you more than a tenth of what you need for the day. Eat some peanut butter along with a few other foods on this list and you’ve got your daily magnesium needs met. Peanut butter is rich in healthy fats and is a decent source of potassium as well. It also has some fiber and a good amount of protein, which is why you’ll see it included on most diet plans, but you’ll want to keep the portion size in check. Both crunchy and smooth version of peanut butter will contain the same amount of magnesium, but you’ll want to make sure that you go with an organic version so you can avoid pesticides and herbicides. It may be a bit tricky to mix up the oil with the peanut butter when you first open it, but it’s worth the effort to make sure you’re getting only organic peanuts in your peanut butter. 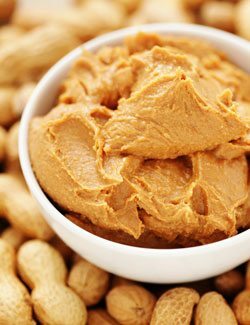 Tips for eating more: Peanut butter spreads nicely over apple slices, celery sticks, and more, and can be added to smoothies for an instant magnesium boost. Lentils are a good source of magnesium, nearly rivaling their bean cousins, but still providing nearly a third of what you need from a 100 gram serving. Lentils can be a reliable source of energy thanks in part to the magnesium they contain, but also because they’ll help prevent blood sugar spikes, providing sustained focus and alertness through your afternoon, rather than brain fog and sluggishness. 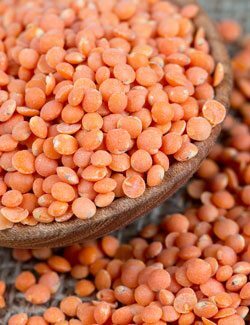 There’s more to lentils than just magnesium, they’re also a good source of iron as well as Vitamin B-6. Iron helps your muscles and brain function at their full potential and Vitamin B-6 also helps your brain, as well as your nervous system. Tips for eating more: Lentils can be used much like beans, either as a side dish, a soup thickener, or as part of a casserole. They have a similar consistency to beans, and provide many of the same benefits, which makes sense since they’re in the same family. The magnesium content of spinach is just one of the reasons why it’s often thought of as one of the healthiest foods you can eat. Spinach is nutrient-dense, and it’s no slouch in the magnesium department, although it didn’t make the top ten on our list. The magnesium in spinach can help improve your mood and fight off feelings of depression, as well as help prevent and soothe migraine pain. We’ve also seen how magnesium can help you sleep at night, which will provide numerous peripheral benefits to your life. Spinach contains phytonutrients that act as antioxidants within the body, making it a key ally in your fight against everything from cancer to heart disease. It’s also recommend on most diet programs thanks to its combination of vitamins and minerals as well as its fiber. It even contains a fair amount of protein for a vegetable. 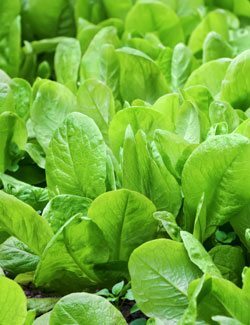 Tips for eating more: Spinach often acts as the backbone to a green smoothie, but also plays well with other foods. Consider adding it to your breakfast to complement eggs, or get into the habit of having a salad with your lunch and dinner and use spinach as the base. Avocados may not have a lot of magnesium compared to some of the other heavy-hitters on our list, but they still provide some, and they have so much more going on that you’re doing yourself a disservice if you aren’t eating enough of them. The healthy fats in avocados will help you feel full, and they also contain vitamins and fiber that will provide overall feelings of wellbeing, and help your digestive system. 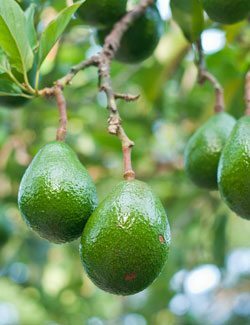 Avocados are also an excellent source of potassium, even more so than a banana. They contain fiber as well, so you are really doing your body a favor when you eat them. Tips for eating more: Add avocado as a side item to any meal. It doesn’t have to be a side dish per se, but can simply serve as a sort of edible garnish to the plate will provide plenty of different benefits in addition to its magnesium content. Bananas are a good way to supplement your magnesium intake, and they’ll provide you with plenty of other benefits as well. One medium-sized banana will provide you with 8% of your total magnesium for the day, so you’ll definitely want to eat some other magnesium-rich foods to get you to your full amount. 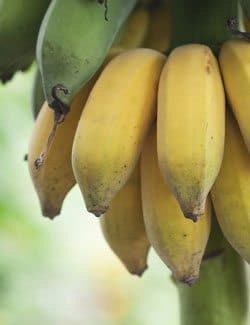 In addition to the magnesium they contain bananas provide fiber that helps your digestive system stay regular, and are also a decent source of Vitamin C, even though oranges usually get all of the credit. One banana will give you a good helping of Vitamin B-6, and important B vitamin for brain health. Bananas are often regarded for their potassium levels, and they are also listed on our top foods highest in potassium list. Tips for eating more: Bananas can go where you go, making them the perfect anytime, anywhere snack. They also work well on oatmeal and cereals, and often factor into smoothie recipes. Sweet potatoes round off our list and provide you with a bit of magnesium that can contribute to your overall total for the day. Sweet potatoes are an excellent source of fiber, and unlike regular potatoes they’ll provide you with antioxidants that your body needs to help prevent damage being done by free radicals. They contain beta-Carotene, the same antioxidant found in carrots, which not only helps your eyesight, but also helps you prevent heart disease and cancer. This is a safe form of Vitamin A, since it comes from a whole food and your body can easily get rid of the excess. 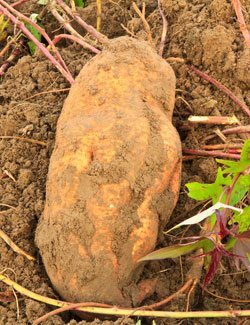 Tips for eating more: Baking your sweet potatoes is probably the easiest way to enjoy them, but you can also boil them up and mash them just like regular potatoes. Try slicing them up and baking them as an alternative to potato chips. Want more? 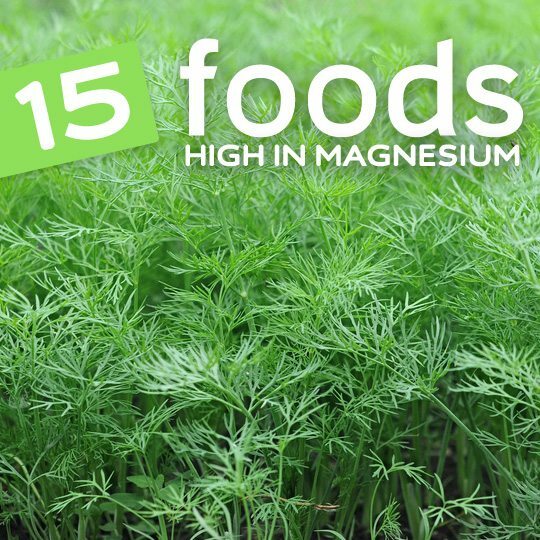 Check out our list of 22 Foods High in Magnesium. Umm, how much of each of these foods contains the amount of magnesium that you list? These figures are pretty high. 100 grams of dark chocolate is a little less than 4 oz . It’s not so much at all within a varied diet. The media tends to be a tad puritanical when it comes to advising we commoners. Meanwhile the rich are doubtlessly scarfing down grassfed butter drenched steamed organic veggies with their wild caught Copper River Salmon lying on a bed of fluffy quinoa and generously sprinkled with lightly toasted filberts. Desert would be some sort of extremely rich raspberry chocolate frosted cake not sparing a calorie of saturated fat. There would also be the finest local blue cheese accompanied by seasonal fruit and an exceptional port wine. No one is fat. It really is all about traditional nutrition and quality of whole food. Saturated fat is not the enemy within a high quality whole food diet. It’s about balance and quality. I’m the Managing Editor at Activation Products, a natural health company. I wanted to reach out to you because we’re going to be posting a piece on our blog about Chocolate and Magnesium and we’d like to link to one of your articles. I thought you might want to read what we’re writing. “Of course, while dark chocolate will get you some of the magnesium you need, it’s important to avoid milk chocolate, since it’s very high in sugar and doesn’t have nearly as much magnesium in it. Dark chocolate is still high in calories too remember, so even when choosing good quality dark stuff, enjoy it in moderation. Are there any changes you’d like to see? I have an extreme reaction when I eat anything that contains magnesium. I can’t even take vitamins that contain magnesium. What started it was my Doctor suggested that I take magnesium supplements for kidney stones and after I took just 3 tablets it gummed me up inside for months. My BM’s were like hard concrete. I finally came out of it by eating a lot of activia. When I told my doctor she didn’t believe me and said “Oh no, magnesium makes you go wouldn’t even discuss it”. I’m wondering if it is because of my welsh heritage and if there is anything I can do to combat it. Thank you! Without magnesium, your muscles cannot relax from their contracted state. You’d die, painfully. So you have to be getting it from some source. Just remember that there are different forms of magnesium. That like what’s in milk of magnesia acts as a laxative. But yeah, no magnesium would mean every muscle in your body would be locked into permanent contraction. No bueno. Magnesium is Very an Important for good health.we should remember how much magnesium is need for your body for good health.Article is very helpful.Thanks for your valuable an information.